This article describes how to set up a Publication Channel in Enterprise Server 9 for publishing content to Facebook. Step 7. 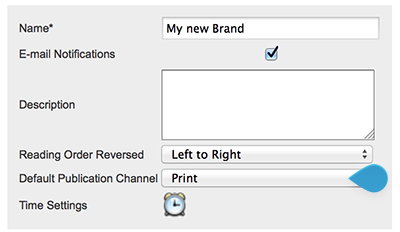 From the Publish System	list, choose Facebook — Publish Forms. Below the Publication Channel properties area, a section for adding Issues appears. How to set these is described in a later step. Step 15. Click the arrow at the bottom of the page to return to the Publication Channel Maintenance page. Step 16. (Optional) Add additional Issues as needed. Step 17. 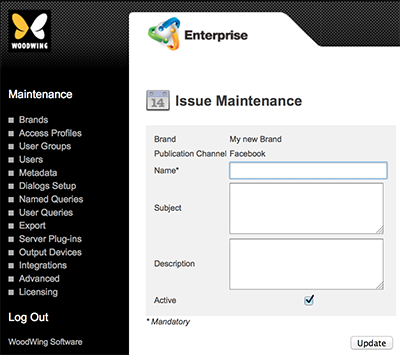 Click the arrow at the bottom of the page to return to the Brand Maintenance page. Step 18. (Optional) Add additional Publication Channels as needed. Step 19. (Optional, only if multiple Publication Channels have been created) From the Default Publication Channel list at the top of the Brand Maintenance page, choose the default Publication Channel that should act as the default Facebook channel.